Fallout 4. It’s super legit. For fans of the franchise, NVIDIA has teamed up with the creators, Bethesda, launching a live wallpaper app of all things to Google Play. 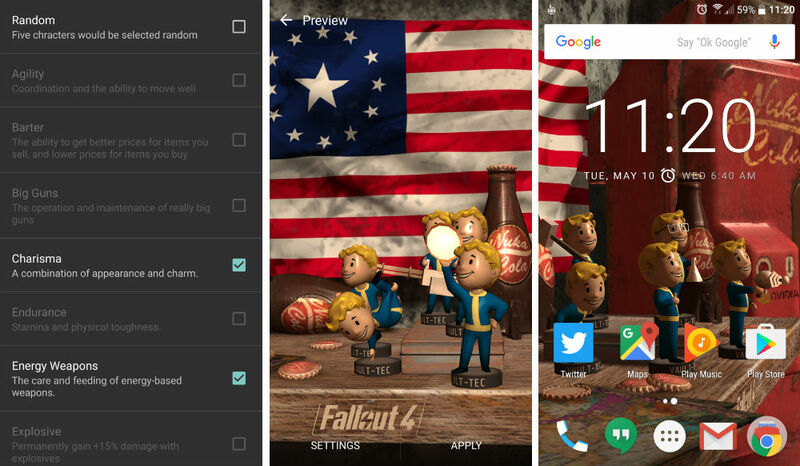 The Fallout 4 Live Wallpaper features an assortment of bobbleheads from the Fallout game, allowing users to deck out their home screen with their favorites. The overall animations you will see are very basic, with the bobbleheads sitting on top of a table. When you swipe through your screens, the lighting and positioning will change, but the bobbleheads don’t move. In the settings of the app, you can choose five specific bobbleheads to show off, or you can have the app randomize which bobbleheads are shown. According to the app’s description, there are 20 Fallout 4 bobbleheads to choose from, including Sneak, Melee, Luck, and Agility. Live wallpapers haven’t really been relevant for the past few years, but since this is Fallout 4, they just received a violent shove back into relevancy. You can download the app right now on Google Play for free.